MOON TOWNSHIP — Robert Morris men’s basketball (13-11, 8-3) is back in the win column this Thursday night after a 72-59 victory over the Bryant Bulldogs (8-14, 5-6). The win comes after a previous weekend that saw the Colonials drop two games in a row, one to Saint Francis University by three points, and the second to FDU in double overtime. Before the two losses, RMU was 7-1 in conference play, the exact same spot they were in this time last year. 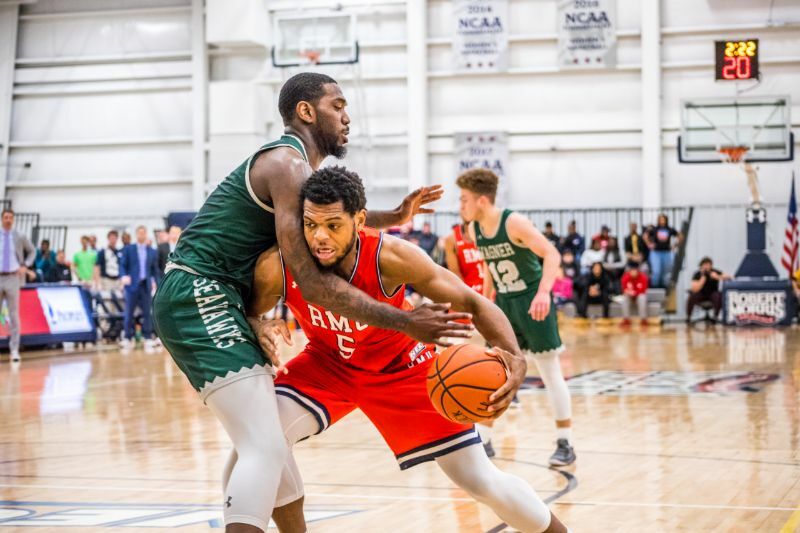 The Colonials finished the previous season 9-9 in conference play, however with fear of another hot start being cut short, the Colonials snapped a short losing streak to remain in first place in the NEC. The Colonials played down for the entirety of the first half after senior guard Byron Hawkins made two three pointers to start the game. Byron was second for the Bulldogs in scoring with 13 points, however the strong first half from the Bulldogs was followed by an even stronger second half by the Colonials. The first half also saw Bryant go on an eight-point scoring run that gave them a nine-point lead, which was the largest of the game for the Bulldogs. Joe Kasperzyk made two free throws, made a steal and a fast break layup during this scoring run that made the game look like it could possibly get out of hand for the Colonials. Kasperzyk tied for first in scoring for Bryant in the game, making eight of his 12 free throws as well as three of his six 3-pointers, he also lead the team in steals with three. The Colonials came out and started the second half with more energy, when Charles Bain, Yannis Mendy, Cameron Wilbon and Dante Treacy all put points on the board to help their team chip away at the Bulldogs lead. However the Bulldogs didn’t give up too easily, when Sabastian Townes made a field goal in the paint and drew a foul to give Bryant a small four point lead with just under 14 minutes left. After Malik Petteway and Yannis Mendy both scored inside the paint, the Colonials had tied the game up at 43-43 just for the Bulldogs to have their leading scorer in Sabastian Townes put up another two-point FG and make another free throw to put Bryant up by four again. After Jon Williams made a three-pointer to bring the Colonials within one, Sayveon McEwan made a layup after stealing the ball that put RMU up by one point over Bryant. Almost immediately after gaining a short lead, Chris Coalmon made a momentum shifting layup, followed by another two points to give RMU a 52-47 lead with just under seven minutes left in the game. Coalmon was definitely on fire in the second half of the game, more specifically the last 10 minutes, where he put up 11 points and hit all five of the shots he attempted. Coalmon came into the game averaging under three points, but put up an unsuspected 12 points. While Coalmon was the player that helped lift the team over Bryant on offense and in terms of momentum, RMU’s bench also outscored Bryant 31-19, and their 18 offensive rebounds dwarfed Bryant’s seven. The first half of the game was slow in terms of offense, where RMU shot 28.6 percent, a drastic difference from their second-half shooting, which was more than doubled at 63.3 percent. As of now, the Colonials sit on top of the NEC by only one game, and are followed by Saint Francis U and Sacred Heart. RMU is back in action against Central Connecticut (10-14, 4-7) who are currently ranked ninth in the NEC standings this Saturday, Feb. 9 at the NAC.